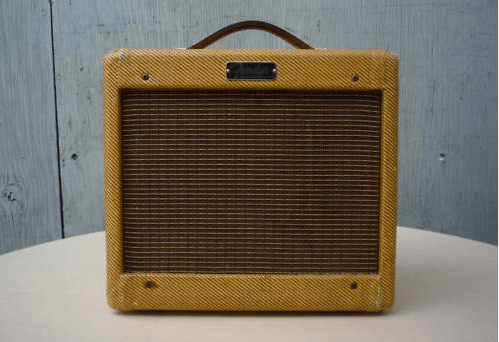 Another user submitted set of photos for tweed Fender Champ C 17435. This is a great looking amp that has had some work done. It has a new handle, a new speaker (the original was sold with the amp) and has been recapped. The serial number indicates an amp from 1962, the speaker code indicates that the speaker was made late in 1960. The tube chart is inconclusive, looks like it is missing the two letter code stamp. This amp was last known to be in Australia – possibly why the 12AX7 tube was crossed out and replaced with a 7025. If anyone knows anything about this, we’d love to hear it.